Inonotus obliquus, commonly known as chaga mushroom (a Latinisation of the Russian term 'чага'), is a fungus in the family Hymenochaetaceae. It is parasitic on birch and other trees. The sterile conk is irregularly formed and has the appearance of burnt charcoal, due to massive ammonts of melanin. Inonotus obliquus grows in birch forests of Russia, Korea, Eastern and Northern Europe, northern areas of the United States, in the North Carolina mountains and in Canada. 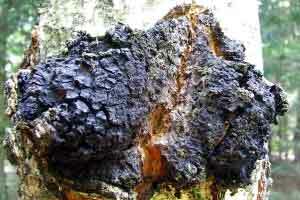 Chaga has been used as a folk remedy in Russia and other North-European countries for centuries. Chaga results in a reduced diversity of phytosterols, particularly lanosterol, an intermediate in the synthesis of ergosterol and lanostane-type triterpenes. This effect was partially reversed by the addition of silver ion, an inhibitor of ergosterol biosynthesis. As a dietary supplement, take 1000mg of Chaga Mushroom Extract once daily. Where to Buy Chaga Mushroom Extract? Nootropics Depot offers 30g or 60g jars of Chaga Whole Fruiting Body Mushroom Extract. Nootropics Depot's Chaga mushroom extract powder has been lab-tested and verified for both product purity and identity. To learn more, read the Chaga mushroom reviews and experiences below. With all the arrows pointing toward nootropics depot being a trustworthy and honest vendor I have to go with my gut and trust them too. I sure hope they keep producing these mushroom extracts as the science seems very promising for them being wonderful for our health. I started taking this with ginger tea, twice a day. It gives me mental clarity and made a flu disappear super fast. One of the "side effects" I noticed was increased libido. I get great energy when taking this. I also seem to be able to avoid getting colds and the flu while on it. I'd highly recommend it.